Considering the time I spent yesterday layering in more color in the background, this does not look as different as I thought it would from the previous shot. Hmmmm...I think this is going to take much longer than I had hoped. I'm trying to capture the soft, out of focus look of the background in my reference images. I find myself zooming in to try to dissect the look of the sparkly fuzzy light and then painstakingly. with tiny strokes try to translate it to my paper. Of course working in this sort of minute detail means that I would probably finish this piece sometime in 2015. So I have to keep reminding myself to back off and loosen up, just squint my eyes and try to draw in the colorful masses and shapes in broad strokes. I suspect the right approach lies somewhere between these two extremes, I'll just have to find it. Neck Work and Get More Background Done Now! There's a big difference between the state of the drawing in the last post and this one. I added a lot more color to his face. Having filled in the background a bit, I felt I had a good enough backdrop to judge the effects of adding more layers and different colors to his face. I continued to add in more layers of Deco Pink, even to most of the highlighted areas, as well as some other lighter colors like Light Peach, Seashell Pink and Soft Pink(CS). In the brightest highlights I only used Titanium Buff,Ivory Oxide and White with a pretty firm pressure. In other areas I layered in a mix of colors, Peach Mineral Orange, Clay Rose, Pink Rose, Goldenrod,Grayed Lavender, Terra Cotta,and even some Blue Violet Lake,all Prismacolor. There is some Pale Brown(CS) and Dark Brown in the darkest shadow areas, along with Tuscan Red. I did some more detail work on his eyes. I strengthened the whites and light grays in the whites of the eyes and added blues, grays and white highlights to the pupils. I also did some work on the shadows of the eyelid creases and carefully added his eyelashes. Last but not least I darkened his eyebrows. There is still a lot of work to be done in darkening the shadow areas more, but I'm pleased with the progress so far. I had to push myself to keep adding more color. It was hard to see initially that the face was too pale. The progress pictures certainly help me too in showing that there is a real difference from one work session to the next. 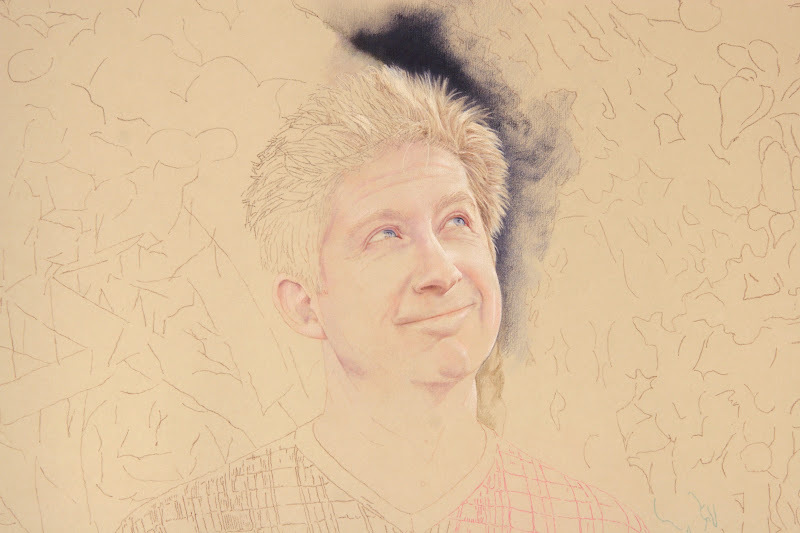 In the first progress shot you can see that I started working on the hair. 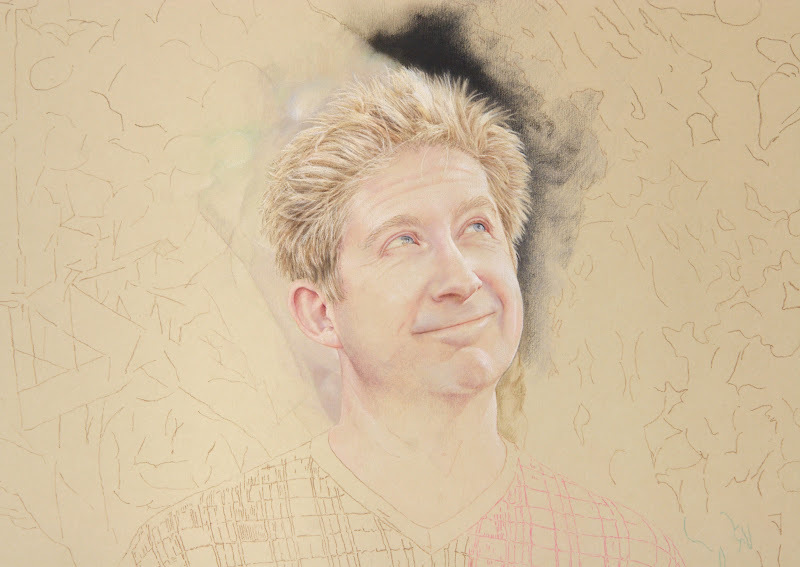 On his face I've applied more color, strengthening the highlights and deepening the shadows a bit. I feel like I will have to add much more color to his face in general, covering up the paper completely. But I don't want to go too far along on his face until I have a better idea of how the background and surrounding colors play off his skintone. 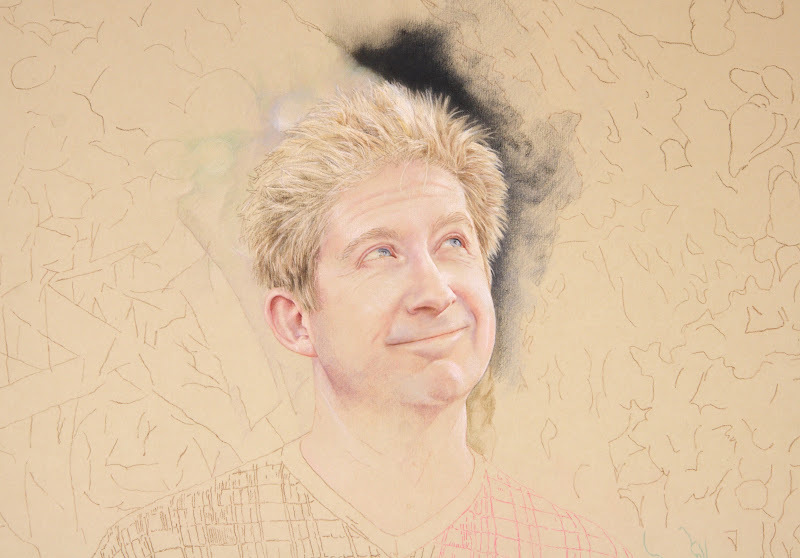 In this picture I have done much more work on his hair and have started filling in the background area around his head. I also added some more layers of color in his face. I did some detail work on his ear because I wanted to define the edges here and give myself a clear boundary to set it apart from the background. It's been much slower going delineating the background behind his hair. No clear cut boundaries here. I've had to switch back and forth between background and hair constantly trying to distinguish one from the other, at least on the lighter background area to the left of his head.